Whisk together whole wheat flour, steel-cut oats, water and yeast set aside for the poolish in a medium bowl. Cover with plastic wrap and rest at room temperature overnight. Whisk together all-purpose, whole wheat and oat flours, flaxseed meal, yeast and salt for the dough in a large bowl. Make a well in the center and pour in poolish, water and olive oil. Stir the wet ingredients into the flour to make a shaggy, sticky dough. Cover with a tea towel or loosely with plastic wrap and let set for 30 minutes. Turn the dough out of the bowl onto a well-floured surface, flour your hands and press dough into a 12 by 8-inch rectangle (long side towards you). Using a bench scraper (or pancake turners), fold the dough like a business letter. (The dough is very wet and this may seem odd, but just move quickly with the scraper and fold one end of the dough over the other. Make sure you brush any flour from the surface of the dough before you fold over the second end). Spray with cooking spray and cover with a tea towel or lightly greased plastic wrap. Let set 30 minutes. Preheat oven to 425°F. Divide the olive oil among two 9-inch square pans and shake to coat the pan. Divide dough in half and transfer a piece to each pan, turn dough over to coat both sides with oil, then press dough evenly into the pans. 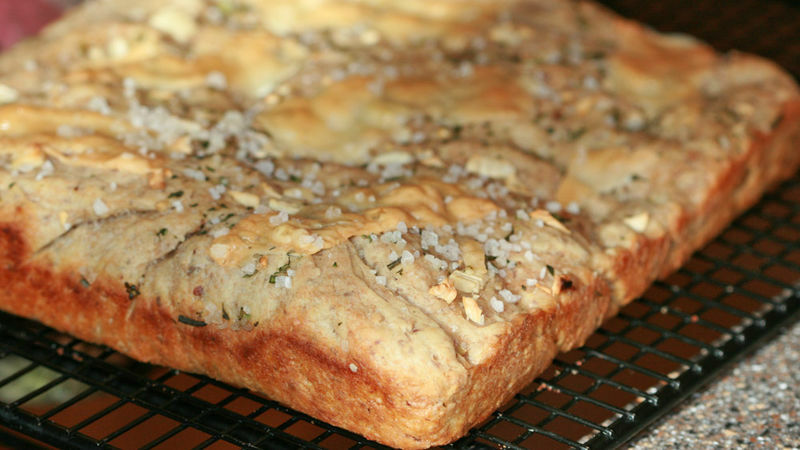 Sprinkle garlic, thyme and rosemary over the top and press toppings into the dough with your fingers. Sprinkle with sea salt and cheese. Bake until golden brown, about 20 to 25 minutes. Allow to cool completely on a wire rack.